At the tab header, click the Add icon and select New Wavelet Field. Type a name for the new wavelet field and click OK. 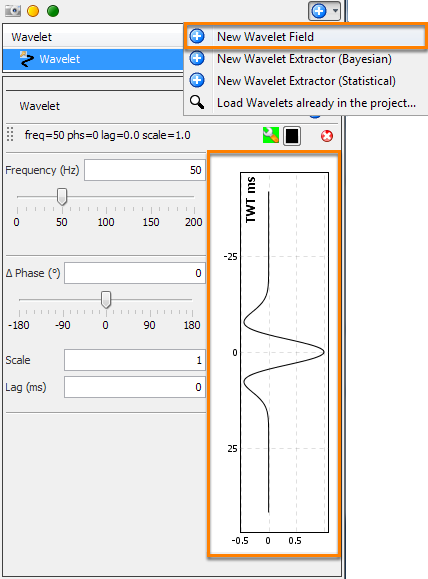 In the Details Panel, move the slider or type the Frequency (Hz) and degree of the wavelet phase at Phase (°). Adjust the amplitude scale of the wavelet at Scale. The wavelet scale should be around 10x the maximum amplitude of the seismic trace for you to view the synthetics. You can further adjust the parameters while doing quality check for synthetics, modeling or spectra analysis. Input a Lag to set a wavelet start time, similar to applying a bulk shift of the wavelet. For example, a lag of 20 ms will cause the wavelet to start at 20 ms.
Based on the defined parameters, the wavelet is displayed in the wavelet preview window (see Configuring the Wavelet Preview Window). To define a location-/time-specific wavelet in the wavelet field, see Location-/Time-specific Wavelet.